For years the sofa Chesterfield has decorated many royal households, prestigious business offices, restaurants, gentlemen's clubs and luxurious homes. Why is it so? In this following post we will take a look at the Chesterfield's history to find out, why is this sofa so popular and demanded. The Chesterfield sofa is in the interior design the synonym for elegance and higher class. Depending on the meaning, this sofa is surely a perfect combination of comfort and sophistication. The success of the Chesterfield sofa started in the 17th century with an English lord Philip Stanhope, the fourth count of Chesterfield. 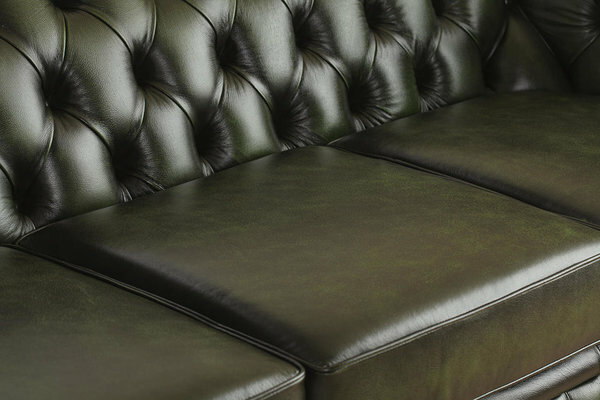 Stanhope ordered a sofa that had distinctive deep buttoned, quilted leather upholstery and low seat base. There are sources that claim this origin story to be false and that originally Chesterfield was the definition of a sofa or chair and that the meaning of this word has just developed in time. Who knows what is the exact truth but what is certain: the sofa's style elements have remained intact. The buttons on the sofa were designed so that one would not sit on the sofa for a very long time. Still, the main aspect of this model is that gentlemen could sit on the sofa without wrinkling their clothes. Over the years when this sofa was used the Chesterfield got an even more elegant look. Although the original design made this sofa quite uncomfortable then today the design has been improved to a point that sitting on the sofa is comfortable and relaxing. The leather sofa with individuality preserved its special charm for years but stayed mainly in the English gentlemen's club indoors. All of the different colour combinations and additional models that have been designed in over 200 years have followed the original model. When the Chesterfield sofa achieved international fame, that was the moment the sofa was considered an English style emblem. When to think of the Chesterfield sofa, the first thing that comes to mind is that a nicely dressed gentleman sits on the sofa in a dark office, drinks a bit of whisky and smokes a cigar. During the Victorian era, the Chesterfield sofa was an essential furniture piece in the living room. Lately, Chesterfield has become popular again being promoted more in the interior design blogs and catalogues. Every new is a forgotten old! 1) Sofa frame. One must see that the material in use is solid wood because it is more durable and does not wear off so quickly compared to other materials like chipboard panels etc. The screw-fixed strengthening corner blocks are also important because they help to maintain the sofa's shape. Cheaper sofas producers use staples and glue rather than using dowelled joints, which influences the shape as well. 2) Upholstery. The best result in upholstery is achieved when different foams are used in the different parts of the sofas to achieve the best possible comfort. In mass production, the producers use the cheapest foam and as little as possible which is why the sofa loses its shape quickly. 3) Suspensions. The suspensions in the original sofa are of high quality and chosen depending on the model. Mass production Chesterfield sofas are made with cheaper suspensions that do not give any support or are too stiff. 4) Leather. 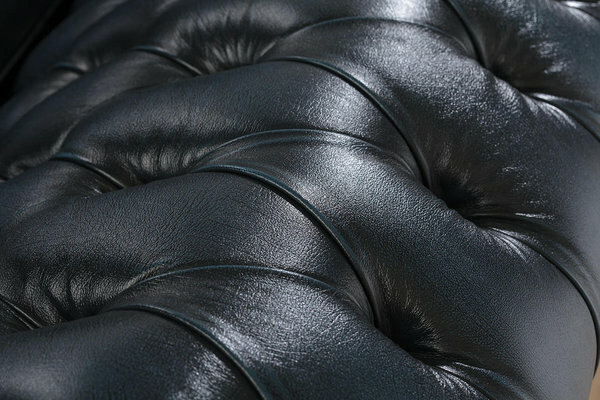 The leather that is being used for the upholstery must be of high quality and natural. To make sure if the leather is natural or not one must take a closer look at the surface pattern. The high-quality leather pattern is unequal. No animal is 100% alike and that can also be seen on the leather. Artificial leather's surface pattern is everywhere the same. 5) Detailing. Adding the deep buttons is a very complex operation and only skilled craftsmen can do it right. Each button has to be added separately and very precisely. In mass production, one can see that these buttons are not added very precisely and deep enough. In Tarmeko Pehmemööbel (upholstery factory) selection are many different Chesterfield models. 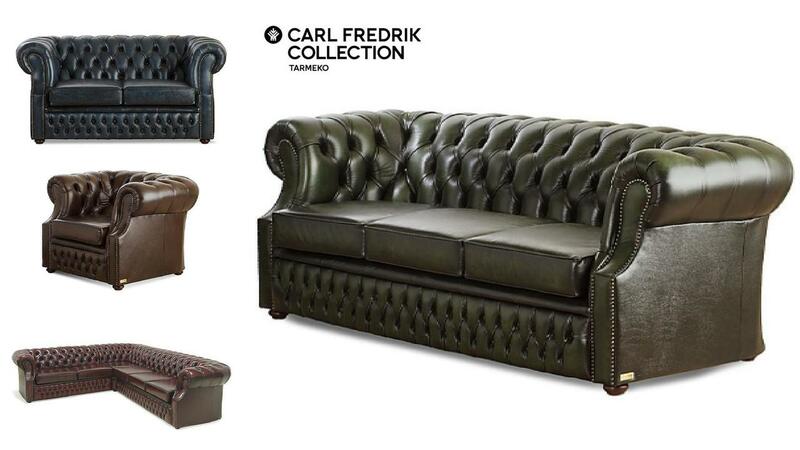 In the collection Carl Fredrik are Chesterfield sofas (2-seater, 3-seater and corner sofa), sofabeds and armchairs. To have a closer look at the products, click here. Tarmeko team hopes that this blog post was interesting to read and that it provoked some interest in the Chesterfield world. If you have any questions, please do not hesitate to ask and write to us on sales@tarmeko.ee. Will will reply as soon as we can!